It can be really tricky to recreate the things you love from restaurants. If you’re super talented, you might just wing it and make up a recipe. Then there are people like me who just keep trying new recipes, like a sucker, and getting frustrated when it doesn’t turn out right. Indian eggplant dishes have given me the most frustration. 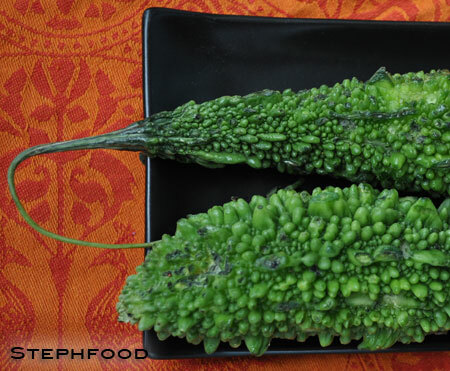 I picked the strangest looking vegetable from BJ Supermarket, in the Gerrard India Bazaar. Its bumpy, bright green flesh was intriguing. The sign said ‘Desi Karela’ – I had never heard of it before, so I wrote it down. A quick Google resulted in many pictures of half-naked girls. Oh wait, I mistakenly typed ‘Desi Kerala’ (Kerala being a state in India). A quick correction brought me to the vegetable I was looking for… and it turned out to be Bitter Gourd. I had read about bitter gourd before – sometimes in recipes with no mention of the fact that this gourd is, in fact, evil. Other times, the author would curse the evil within, with comments such as “Why would anyone ever want to eat this?!”. Although frightened, I refused to give up and I found a recipe that sounded like the perfect way to introduce myself to Desi Karela. 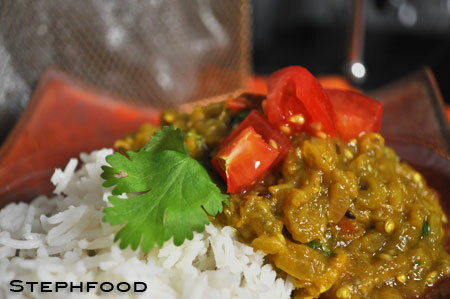 I chose this recipe from Foodskaypes, because the mix of bitter gourd with coconut and tamarind sounded really tasty and different from the dishes I usually make. 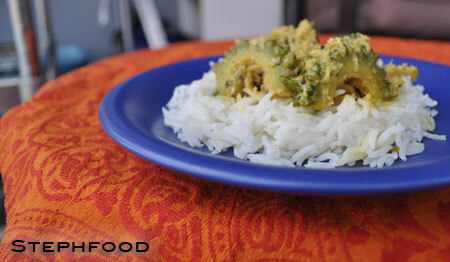 In case you are planning to click that link and read the recipe – no, I didn’t buy a fresh coconut and grate it for my dish. We aren’t used to fresh coconut here, so I bought the packaged (unsweetened) stuff. No doubt it isn’t as good as fresh, but you gotta do what you gotta do. The dish smelled amazing as it was cooking. It was a fun assortment of spices (yay! ), and I crossed my fingers that the karela wasn’t too bitter. Then I tasted the sauce. It was so bitter that my heart immediately sank, and I scolded myself for not making a backup dish. I knew J would NOT like this. We sat down to eat, and I took my first bite. Yowza, that gourd is bitter! Bite two wasn’t so bad, and by bite three I noticed a flavour beyond the bitter that intrigued me, something I’m sure I haven’t tasted anywhere else. I looked up at J, who had also taken about three bites. “That’s about all I can do. My lips are going numb.” That was that. I finished his plate, and gave myself a little bit more, and he went to the fridge for some pitas and veggies. I should mention that the recipe itself was great, and I’ll be trying it again with some other, less evil vegetable. I don’t think I’ll be buying desi karela again, but I’m really happy I tried it once. The leftovers are still in my fridge, waiting for me to finish them. I’m kind of afraid of what it will taste like – you know how evil is when given time to collude. Sorry, J. I swear I didn’t try to poison you! Today’s salad is inspired by Indian spices and flavour combinations. I’m obsessed with my collection of spices, and I was happy to be able to pull out some of my (recently ignored) Indian spices today. Possibly the most exciting part for me is the amchoor powder. Amchoor is powdered dried mango, and it has a really neat tart flavour. I have to say that I don’t use this one all that often – it’s not that in many recipes that I come across, and I sometimes forget that I have it. 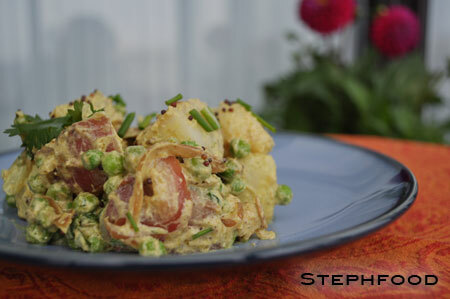 Today was very different – this was the first thing I thought of when I decided to make chickpea salad. It started with me coming across my stash of dried chickpeas. I decided to try cooking them up again, even though I have never been successful at this task. The price of canned legumes keeps going up so I thought I should give it another go. More on that later. Jump to a couple of days later, nicely cooked chickpeas at hand, and me coming up with ideas for my Indian-inspired chickpea salad. Summer salads should be fun, fresh, zesty, and exciting… ding, ding, ding!! I thought of the sour amchoor powder at the back of my spice drawer. Mixed with other spices, such as cumin, coriander, tumeric and cayenne, I was able to make a very flavourful dressing that wasn’t heavy or creamy. I opted to add in some fresh veggies and fruits to round it out, including some just perfectly ripe apricots for a little more sweet and sour – I would have used mango, but apricots are in season here, and I thought something fresh and local would be best. 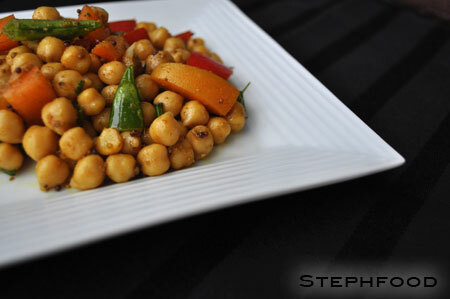 About the cooking of the chickpeas… in the past, I have failed miserably at cooking up dried legumes. They often came out mushy or mealy and just plain terrible. That said, buying them dried is much cheaper than buying them canned, so I thought it couldn’t hurt to try again. 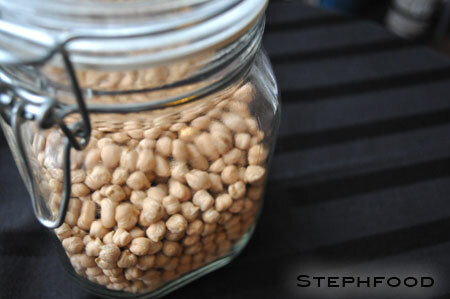 I started with 2 cups of dried chick peas, soaking them in a LOT of water in the fridge. I read to soak them overnight, but I ended up soaking them for two (only because I didn’t have time to do anything with them right away). I discarded the soaking water each day, and just before cooking. I cooked them in a large pot of boiling water and it only took about 40 minutes (brought to a boil, then simmered). I tested along the way, just to ensure I didn’t overcook them. I should also add that I didn’t add anything to the soaking or cooking water – no salt, flour, baking soda… nothing. They cooked up perfectly. As good as canned, if not better. Two cups of dried chick peas probably yielded 5-6 cups of cooked, and it cost less than a 19oz can of chickpeas, which would only contain about 2.5 cups.